I was sent a complementary copy of Juniper QFX5100 Series: A Comprehensive Guide to Building Next-Generation Networks by Doug Hanks. Doug works for Juniper. I’ve met Doug a few times, and he’s been a guest on the Packet Pushers podcast. The book is not simply a guide to the QFX5100 Ethernet switch, although it certainly is that, including a complete architecture breakdown and description of the platform’s control-plane virtualization. The book is also a design guide, explaining how to scale large data centers leveraging both high host-facing port density and automation techniques. In that sense, this is a reference book not just for the QFX5100, but also for the Juniper perspective on how to build very large data center infrastructures. 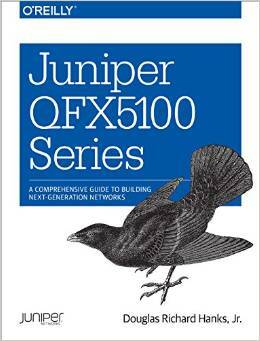 Several of the techniques covered are not unique to the QFX5100, but are available at least in part on other Juniper products as well, including Puppet & Chef agents, the Junos PyEZ automation library for Python, and overlay networking. Once again, note that this book is a reference for data center networking from the Juniper perspective, and I don’t mean that as a negative. But as a prospective book buyer, you need to understand that like most vendor-focused books, there’s a specific story to tell, and it’s coming from a particular point of view. As it happens, Juniper has a great story to tell, and even if you’ve never logged into a Junos CLI in your life, you can learn a lot. But don’t mistake this book as a general networking reference. It isn’t, although there are multi-vendor techniques covered in places. On readability, I find Doug’s writing easy to read. This book is much more of a practical, engineer’s guide than an academic guide. Academic texts leave me reading a chapter and wondering what just happened and why I’m so sad. OTOH, Doug writes text expecting that people who actually build and operate networks will read it. He’s pretty good at anticipating the concerns engineers have and the things they might be curious about. The book is also seasoned liberally with diagrams and code examples. Bottom-line – a worthwhile (and not overly long) read. If you’re deploying a Juniper-based data center, you should absolutely get this book. Thanks for the blog post, enjoyed reading it I’m aways happy to answer any Juniper questions. Good Luck Doug with the new book !